Put everything except the potatoes and carrots in a big pot and cover well with water (5 or 6 liters is about right). Bring the pot to the boil and then reduce heat, skimming any foam that rises from time to time. After an hour, add the potatoes and carrots and continue to cook until they are tender. 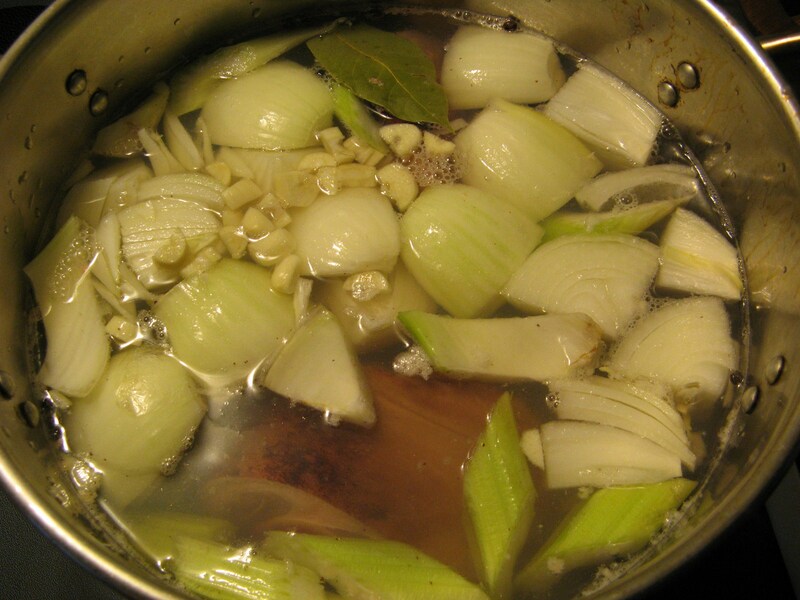 Remove the vegetables and pork hocks from the stock. The stock is not finished yet, but some of the vegetables and meat will be used in a further dish, while the skin and bones will go back into the pot with what remains being used for a bonus lunch. You can now continue to cook down the pork stock, with the bones and skin from the meal being added back, of course. Once you are done (two or three hours later), you will have four liters or so of delicious stock that will become a thick gel when cooled. 2 liters of pork stock (dilute with water if too strong). You first need to prepare the leftovers from the stock making by cutting the vegetables into chunks and tearing the meat into longish shreds. Bring stock to boil and add the whole, scrubbed beets. Boil gently for about 15 minutes or so. Remove beets and cool. Slip skins off and the julienne the beets. Return to pot along with cabbage and tomatoes, bringing back to gentle boil. If using the beet greens, add them at this time too. Keep adding water as necessary to keep up the level. Cook for another 15 minutes or so. Cook the onion in a bit of oil until translucent. Add tomato paste and water, mixing well. Add to pot with beets and cabbage and then put in the potatoes, carrots and meat. Bring the pot back up to a simmer. Add garlic, salt, pepper and sugar. Turn off heat, cover and let stand for 5 minutes. Serve with dollops of sour cream on top and garnished with dill, if desired. Slice bacon into thick slices and put into large, heavy bottomed pot with a little oil (or butter for decadence) on a low or medium low heat. Fry for a couple of minutes and then add onions. Cook until bacon is browning and onions start to caramelize. Add garlic and ginger and stir well. Cook for a couple more minutes. Add cumin, turmeric, ajowan seed, bay, cinnamon and chilies. Cook for another 3 or 4 minutes. Add drained dal and mix well, allowing to cook for a few more minutes, stirring often. Add tomatoes and pork stock and stir well. Bring to a boil and simmer until dal are done. This will take a varying length of time depending on the size of dal or whether it was split or not. The larger lentils can take a couple of hours. Add water as necessary. It seems “the wife” has to work very hard while you are away! Kudo to you, madam! I want to comment on the pork hock, which we asian usually refer to pig feet ( I know it is like the leg, but not the feet). At any rate, do you know that the Okinawa studies of the centenarian, found that one of the reasons of long life is the diet, which includes pig feet (. also pork hock) , because of the collagen of the skin of the pigs ! Keep an eye…the wife will be getting younger and younger! Heavens … I’ll never keep up!! …ha ha…unless you also eat pig feet…! Wife is brilliant! I have recently read that beet greens are edible and I love the flavor. I am definitely going to try this, it is wonderful. My one dish that goes on and on, is hubbies fav. I need a dish like this when I am busy with a project, like now! A blueprint for ease, thank you! HUH, I showed husband and he only saw the very large bottle of rum… now he thinks this is a series of nice rum recipes… sigh! Now that’s how to cook – spoon in one hand, liquor in the other! (although I do not drink…..wine) it still looks fun. What part of the country is your wife from that she dips pork hock in vinegar? when we cook fresh ham, we always have a container of American mustard on the table to put a splutch on the plate and then lightly dab the pork into. I’m a born and bred Southerner…so. Pork and vinegar is on the way to being NC bbq. Our neighbor never used the greens in her borscht (Russian). She did cook the greens separately as one would cook turnip greens, collards, etc. She also added to tossed salads. She had a similar contraption to the ulu that was her great grandmother’s. it was half the size and wicked sharp. she used it to cut all kinds of things. Please have your wife as a guest again! her recipes were delightful and great to look at. Be careful of that collagen though, for sure. Southern ladies know how young fatty pork keeps you – hocks, etc. they feed them to their men so they can sort of keep up with them, along with lots of oysters – fried, steamed, raw, in stews…. My wife grew up in Western Canada (Alberta and BC)… but I don’t think the vinegar dipping is a regional specialty… just more of a family thing. From “the Wife”: Actually,the original pork hocks recipe is from my Mom who is from English/Scottish roots. She would just put the stock down the sink (gasp!).. She never actually gave me the “recipe” but this tastes pretty much the same. IMPORTANT TIP: the dal just isn’t anywhere near as good if its not done with this port stock – THAT’S the magic ingredient. I know its laborious but SOOOOO worth it! The borscht looks very “warming”. Good for the cold weather coming. Thanks for sharing – I will borrow this recipe. We are getting a lot of beets and cabbage from our CSA share. If I may say, the pork hock stock is really important. If you don’t have leftover carrots and spuds, that’s no problem because you can add them fresh earlier in the recipe. bacon in dal? Really makes me wish I wasn’t a silly vegetarian! Oh come on! WHAT is life without BACON!!!!! No. Never.Can’t do it. I would also recommend for beet greens, stir frying them with chopped red pepper, a tomato (not critical if you don’t have one), onions, garlic and ginger root all cooked with a dab of chili paste and soy sauce. Yummy when cooked with pasta. With the dal I suggest cooking the ginger into matchsticks because it give a good blast of flavour! It’s been a long while since I’ve enjoyed pork hocks, and now you’ve made me want to make them. The dal looks very tasty too. I unfortunately have some kind of irrational aversion to borscht, which I think goes back to my childhood. It used to be for all things beet, but in recent years I’ve discovered I actually really like roasted beets. Once day I’ll come to my senses and discover that borscht doesn’t bite. How lovely to see some of your wife’s fabulous cooking – it all looks scrumity. love pork hock! may i suggest blanching the pork hock first for about 5 minutes to “clean” it from dirt, blood, etc and I promise you that when you make your broth, you don’t need to scoop the foam out. 🙂 I will try your borscht recipe, I tried to make it the other day and it was a disaster. Your wife looks very well-balanced–and damned happy. That bottle does wonders, eh? This all looks so good! Can you tell me what “dal” is? dal is a colective name for lentils and a few other legumes. It also refers to dishes made from them… There *so* many variations!